After that breakfast–and accidentally sleeping in–our day was off to a late start. We didn’t leave San Antonio until about 11 a.m. And then we drove. And drove. And drove some more. 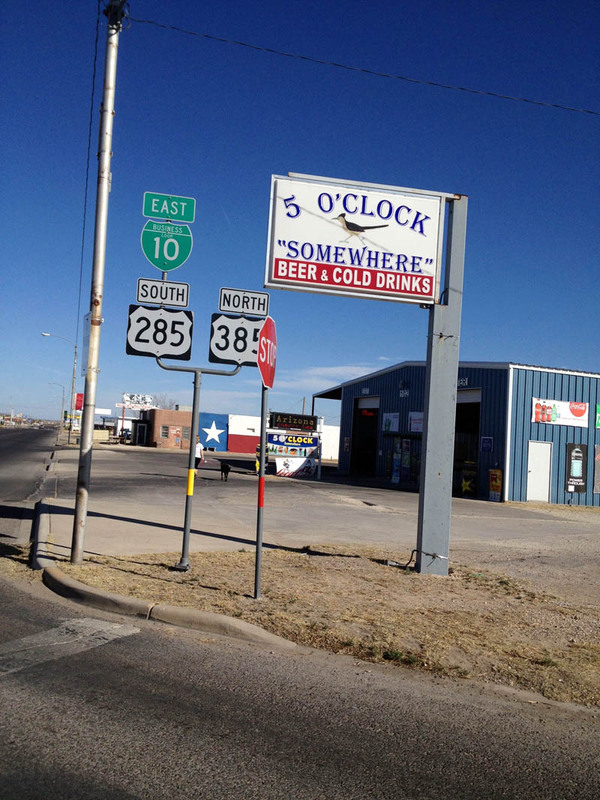 We stopped frequently to fill up our gas tank, and fear of running out in west Texas convinced us to pay ridiculous amounts per gallon at one station. Every few hours, we’d also stop for some more drinks–teas, juices, sodas, plus the many water bottles we filled at the hotels each morning. Hydration was key. Perhaps the most important part of our drive through west Texas was our purchase of The Da Vinci Code audiobook that took a few hours to download onto my dad’s phone. Suspense and intrigue kept our attention for miles and miles, chapters and chapters. I’d never read it before, and though it meant we didn’t even have time to listen to any podcasts or NPR newscasts or music on the radio, we were OK with that. This book may be difficult to listen to on shorter road trips, but for three full days, it occupied our minds. If we missed even a few minutes of the audio, we were lost. Listening to the complex and ever-evolving story also prevented either of us from napping for the entire 3,000-mile trip. 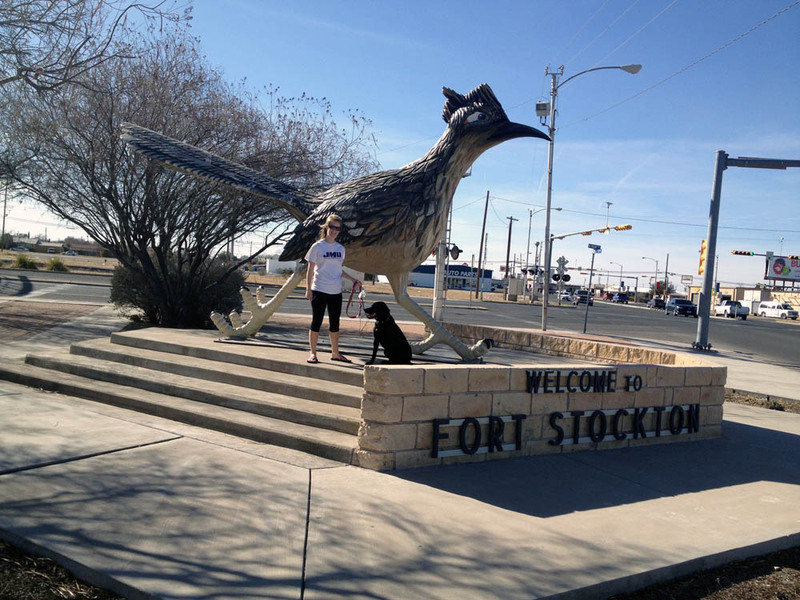 Our single stop of any notable length was in Fort Stockton, around 4 p.m. Home to the world’s second largest roadrunner statue, this seemed like a town we couldn’t miss. Right? That, and Rachel (and the two of us!) needed to walk a bit. At first, we couldn’t even find the Roadside America-famed statue, but then lo and behold, there it was, at the intersection by the visitors center and Main Street. Paisano Pete, as the statue is named, used to be the world’s largest, but was unthroned by a roadrunner made of recyclables in neighboring New Mexico. Stop in the visitors center though, and they’ll still give you a free pin to remember your stop. Plus, next door was a beer-thru, so after our pb&j’s, we picked up a 6-pack of Texas-brewed Shiner Bock to drink whenever we finally made it to our hotel in the next state. Hours passed in the car, and we drove onward, past tiny towns that were no longer towns and parallel to mountain ranges in Mexico. We drove through traffic-heavy El Paso and, finally, into New Mexico. A lack of dog walking time left Rachel very anxious and unsettled that night, and fetch-on-a-leash, walks around the hotel and around the hotel again, and lots of bone chewing didn’t help. Not until she hopped into my bed did she finally start to settle down, slightly, and we could all get some much-needed sleep. This piece should be titled “The Longest Day”. 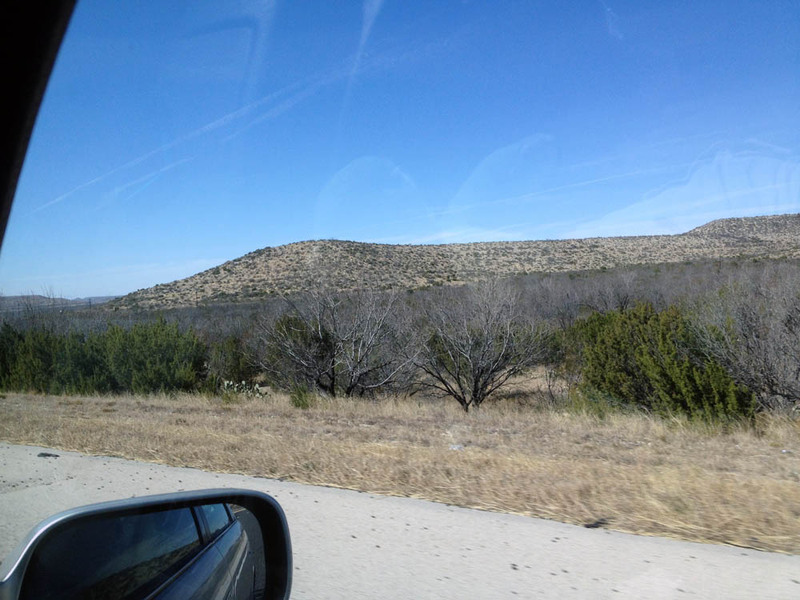 Eleven and a half hours of driving from San Antonio, TX to Deming NM. At least we had a good bed at the hampton Inn and a cold beer waiting for us at the end.